The world's largest technology show, CES, has long been known as the place to unveil brand new tellies. Which is exactly what LG did at CES 2018 with its latest and greatest W8 Signature OLED. We got to see the new top-tier set behind closed doors at the show to see how it has advanced on the "Wallpaper"-thin W7 model from last year. The W8 brings with it the ThinQ smart software platform, integrated Google Assistant (to the US market, not the UK), along with the new a9 ("alpha nine" / α9) processor for improved image quality. However, with Samsung teasing its brighter-than-OLED MicroLED technology at the show and Panasonic unveiling its top-spec OLED competitor, does the W8 do enough to keep LG's seat as the TV king? But first a word on just how stunning this set looks. The panel itself is just that: there's no bezel, no plastic lump on the back no connections, apart from the barely noticeable ribbon that drops down to the accompanying Dolby Atmos soundbar. That soundbar contains the TV's processor guts and is also the source of all the connections, so you're not only getting great sound, but those great Dolby Vision certified and HDR Pro (that's LG's way of saying HDR10) high dynamic range images. The LG OLED W8 will be available in 77 and 65-inch sizes and remains something of a novelty. Ultimately it's an install-only TV, designed to integrate into a space seamlessly, which makes it highly appealing for high-end AV fans, but a likely nightmare for those who just want a more basic telly design with an included stand. If you are looking for a more manageable plonk-it-on-a-stand design then look to the G8, E8, C8 and B8 options, also unveiled at CES 2018. The visuals are the same for all, bar the B8 - which has the lower-spec a7 processor ("alpha seven" / α7) and, therefore, image quality on par with the B7 from 2017. LG blew us away with its 2017 range of OLED TVs, as the range upped the brightness compared to 2016's equivalents, while retaining OLED's unique sell: that blacks are true blacks, thanks to pixel-by-pixel control and no separate backlight requirement (as you'll find in LED tellies, which can exhibit light leakage and clouding). So what for 2018? It's all about updated processing. LG has decided to give its processor a fancy name, here the a9 (this, amusingly, is the name of an interchangeable lens Sony camera), which is designed to handle banding and motion better than its competitors and, of course, last year's LG OLED range. We were privvy to various demos showing off this enhanced processing. It's certainly an improvement, but the jump between 2017 and 2018 models isn't huge. Yes, banding is better handled and there's less shimmer in fine detail of moving subjects compared to the 2017 model. But it's a relatively minor jump. It's in the HDR (high dynamic range) department that LG really shows its worth. With support for Dolby Vision, HDR Pro (LG's naming for HDR10), Hybrid Log-Gamma (HLG, which will be used for broadcast HDR), and Advanced HDR by Technicolor, there's very little missing. Sure, HDR10+ is absent, but that tech - which uses additional metadata compared to the "non-plus" HDR10 - but that tech will likely only feature in Samsung and Panasonic tellies for the foreseeable future. In short: with already epic OLED quality and unrivalled blacks, LG has made an already great TV range a step better in the visuals department. With enhanced HDR compatibility and increasing content that's where the benefits will be seen the most, as most consumers otherwise probably wouldn't tell the W7 from the W8. Oh, and let's not forget just how good the Dolby Atmos soundbar of the W8 sounds. Not only does it deliver three-dimensional sound from compatible Dolby Atmos content, it sounds great whatever is being watched. The other area where the 2018 range elevates performance is in the software. You may know that LG's Signature series - and we're talking kitchen and home appliances here - include SmartThinQ technology, which allows you to control such products via an app. With the W8 TV, the ThinQ platform has been utilised to tie together the brand's connected tech under one altogether more familiar umbrella; to enable the TV to act as a smart home hub. But what does ThinQ actually do? Well, it's all about artificial intelligence and voice control. A press on a button on the TV's remote control and you can ask a question or command, which will be answered or enacted using LG's on-board software. That can be done in a number of other ways, thanks to Google Assistant and Amazon Echo compatibility. In the US Google Assistant is actually built into the TV - so can be used straight off the bat. In the UK, however, Google's smart assistant won't be integrated - but, if you have a Google Home product, then you can converse via this. It's the same deal with Amazon's Alexa. Whether Google and Amazon full integration will happen later down the line remains to be seen. And LG couldn't give us a definitive answer - saying it's one for Google to address. 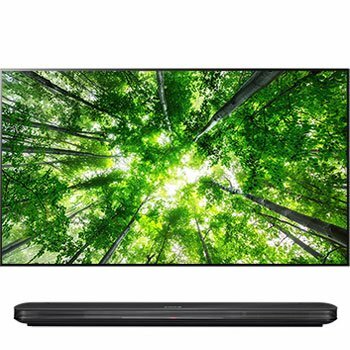 Overall the LG W8 is a jaw-droppingly stunning install-only TV proposition, with an ultra-thin design that will almost invisibly integrate into a room, along with excellent Dolby Atmos sound and top-drawer OLED quality. However, it doesn't add a huge deal more compared to 2017's W7 - especially for UK customers, who'll miss out on the Google Assistant integration. That ignored, however, and it's picture aficionados who'll revel in the W8's bevvy of HDR capabilities and improved processing when it comes to handling banding and motion. And if you'd rather have a stand for your home then LG G8, E8 and C8 will all deliver identical picture quality - it's just a choice of install, design and sound quality preferences that separate this quad of fantastic tellies. The LG W8 Signature OLED TV will be available in 2018, with dates and prices yet to be announced.